Yeah, I almost fell off my chair, too. The plan here is to include Canonical‘s Ubuntu Linux Bash shell into Windows. This move is rather clever – if long overdue – since any developer worth anything can tell you that Linux is where it’s at in terms of servers, common tools, frameworks, etc. Anyway, it’s not a virtual machine, so no VM software (or the accompanying slowness) is required. 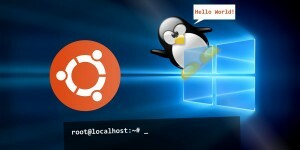 The Ubuntu Bash shell will basically be the Ubuntu command prompt integrated into Windows. How integrated, you ask? Of course, as the video mentions, it’s not quite done yet… And everything doesn’t “just work” quite yet. But the possibilities here for developers are pretty awesome. For example, have you ever installed Ruby for Windows? And then did you try to install a gem like Nokogiri? Remember how it crapped out, and then you tried to jump through the 75,000 hoops to make it install? Then do you remember how you gave up and just fired up your VM of Ubuntu? Well, theoretically, those days will soon be gone if you’re using Windows 10. Bash will work just like a real Linux install, including apt-get, compiling stuff, and you can even access the Windows file system from within the Linux shell. Imagine being able to do all your Linux shell stuff natively in Windows, and then edit those files with a Windows-based editor like SublimeText – seamlessly! That’s gonna be pretty sweet! What else is new in the Windows 10 Anniversary Update? There are several new goodies, but I imagine most of them won’t matter much to most people. All Apps – Minor change in viewing “All Apps” in the Start Menu. No biggie. Windows Ink – more touchscreen/pen input goodness. Yawn. Cortana – she’s gonna be even more awesome! Sigh. Edge Store – like Google’s Chrome Store. Wait, does anyone actually use Edge? FTLOG, why?! So, yeah, as you can see, so far this Win 10 update doesn’t look like it will bring much. There is another rumor of an updated File Explorer in Windows 10, but no one seems to know if/when that will actually happen. So, should I upgrade, or not? At this point, I’m telling everyone they should upgrade to Windows 10. #2 is already a problem in some cases… For example, you buy a new motherboard. You go to the manufacturer’s web site to download drivers. Guess what? There are no Windows 7 drivers. Guess what else? The Windows 10 drivers often won’t even install on Windows 7. Oops! So, the time has come… You’re going to end up with Windows 10 eventually anyway, so why not take the plunge while it’s still free?